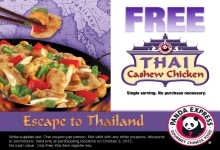 Get a taste of Thailand from Panda Express! Use this printable and you’ll get a free single serving of their Thai Cashew Chicken! I like food of panda express . CouponBlog.com is for sale, Get the name that defines the category!